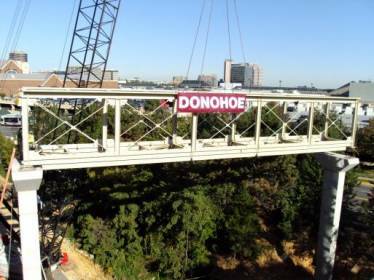 In July of 2009, Portland Bolt supplied high strength cross bracing assemblies for the Tysons Corner Covered Pedestrian Bridge. The bridge will connect the 13-story 295,000 square foot office building at 1850 Towers Crescent Plaza to Tysons Corner Center, a complex in Vienna, Virginia that includes more than 300 retailers. The 32 cross bracing assemblies consisted of a 4-way, left hand threaded center connection with 1-1/2″ diameter A354 grade BD rods. Each rod was anchored with a 15″ deep right hand threaded A572 grade 50 sleeve. The right hand / left hand thread pattern allowed for adjustment during erection. The high strength rods varied in length from 38″ to 83″. 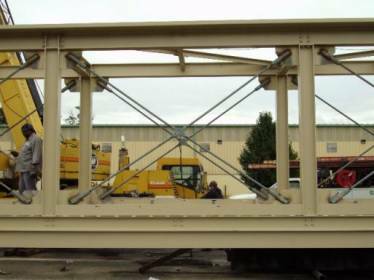 Portland Bolt was selected for this project due to the critical delivery requirements and the complex nature of the assemblies. 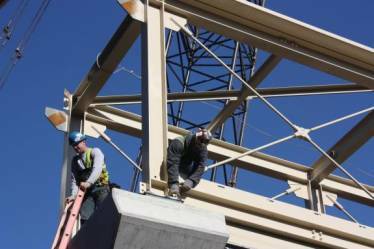 The steel fabricator responsible for providing these cross bracing assemblies needed a reputable manufacturer that could ensure the product would be delivered on time and the assemblies would function properly during erection. The machined components and high strength rods were manufactured on schedule and assembled in Portland Bolt’s 94,000 square foot manufacturing facility prior to shipping. The assemblies functioned flawlessly, proving once again that Portland Bolt can deliver nonstandard construction fasteners quickly and competitively anywhere in the country.